Well heres the thing, I am completely centered and Obsessed with Bethenny Frankel. I have always been, and probably always will be, turned on by Powerful women, especially if they are women who have created empires, “e.g. Skinny Girl Margarita”. Her show is perhaps as addicting as the personality behind it, and there is one thing on her show that I have always wanted to do, and that was the famous Food Crawl. Given that it was the last week of the Texas State Fair, I figured this was the perfect opportunity to take part in the this crazy idea. Can you believe that after five years in the Dazzling D-city, this was to be my first Fair, after 125 years of the State Fair I figured, “Milestone Year, Mile Long Crawl”. So I grabbed my Bowler, and somehow managed to talk my Best Friend, Robert Chapa, into trying this so-called Food Crawl out. Pretty much everyone is familiar with the delicacies of the Texas State Fair, but if not there is only one thing you need to know about the food, and the only official rule to the Food Crawl my best Friend and I were starting dread. The Texas State Fair year after year, in fact 125 of the them, take part in the state-wide competition in the Art of Frying. 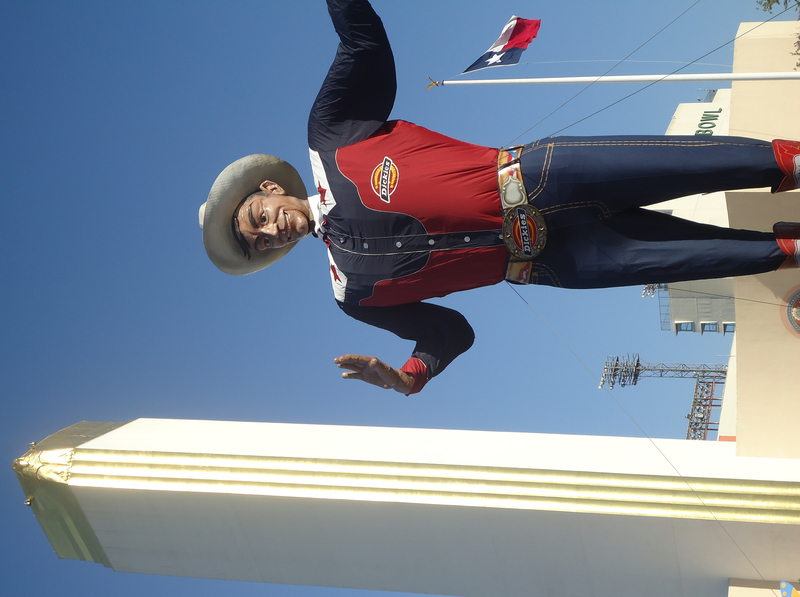 Thats right, aside from Big TEX, the fried food that could be found at our Fair is perhaps the most famous aspect that tends to bring people from all over Yonder. So our challenge was, Everything that was to be consumed had to be Fried (Sinfull isn’t it). I might as well ask God for some Forgiveness for what im about to let my entire fashion world know of what my bestie and I ate. From Fried Butter to Fried Lattes, The Term “Texas Bred, Texas Fed“, took on an entirely new meaning , which I wasnt prepared receive that title in my life. As a DFW citizen, the DART Green Line was a must, I had yet tried to get on the green line, which has come to be known as the “High End Line” or so to speak, for it makes stops at DFW’s most notable shops. It Gave the fair, a DFW ambience you can say. As we arrived at Fair Park I could already smell the saturated fat, and feel free to judge me, I was overwhelming excited about it. I did plan for it, that night before I took part in an almost biblical fast in order to welcome the sin of gluttony in my life. My friend and I, made our donation to the can good food drive, and made way to the coupon stations and purchase $100 worth of food tickets, “yes I was that committed”. 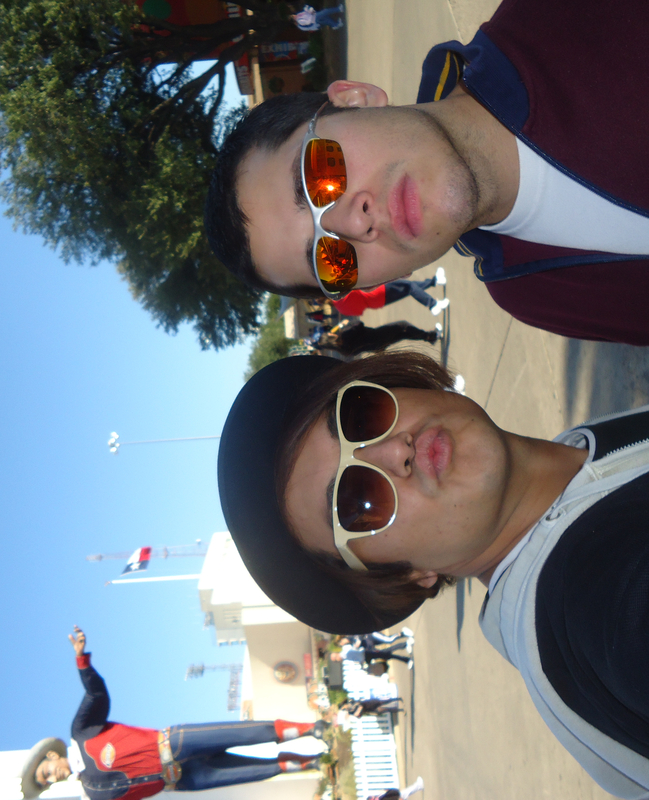 Big TEX was coming in sight, we decided to take a few photos, given we were probably about to gain a few pounds, it would be the last photo of our soon to be former skinny selves. We made way to our first hit of the crawl, and my BFF Robert was so excited to order the Fried Catfish, which could be found at every southern comfort establishments around theses parts, and it was a tad heavy to start off the Crawl,but we order! As the Body By Bethenny DVDs teach you, it’s all in the warm up. My choice however for my 1st hit of the crawl, was a Fried stuffed Potato which was beyond delicious. Our Orignal plan was to hit, 25 food items, given the Fair’s Milestone year and all, however the Crawl soon became a Drag, after we hit five. I couldn’t help but ask myself, “How the Hell does Bethenny Do these Food Crawls”, then I thought, “YOGA”. After our savory items, Robert and I decided to take a break to recover from the massive amount savouries we had sinfully indulged in. Then out of no where, somewhere between The Texas Sized Farris Wheel and the incarcerated bunnies, my partner in crime spotted Fried Pumpkin Autumn Pie. To be honest I have never been much of a Pumpkin Pal to my bestie. If you have been following his Facebook Posts you would see the obsession he has with anything pumpkin Spiced. So from the Savory, and Fried pumpkin pie now in sight, we made a major mistake and dove right into the sweets. Holly Molly, is all I have to say when it came to our crawl. we had all the Texas Favs, and it was hard to Pick a favorite, which is what I had planned for today’s post, to follow through all the foodies and decide the winner for myself, but yet another sin came to be, Greed for all were so Delicious. The Texas State Fair, was beyond what I had learned in Texas History Class, it was super fun, and the food will seriously speak for itself when you look at the list of Fried favorites below. Considering it’s the last week, which in some odd way im thankful for, because, if it was the first week I probably would have returned several times, to crawl the areas I missed. It was truly a food filled experience, and the shirts I bought (after all, this is a fashion blog) may have to wait to be worn, a few visits to the gym are in order, a form of repentance you can say. So Heres to Next Year, which im starting to train for that crawl as we speak. As for Bethenny Frankel well, im starting to see why she has created an empire after the Skinny Girl, she cuts around the corners in order to take part in these so-called crawls, Smart Women that Bethenny. I do have to truthfully admit as miserable as I may feel today, after eating all things fried, the food crawl was UBER FUNNESS, I suggest this guilty pleasure activity to any one who enjoys a good challenge, and Texas Sized Food. #1 Fried Stuffed Potato there were no words to say how fab it was #2 Classic Corny Dog overwhelmingly AMAZING! #3 Fried Catfish and #4 Fried Salsa, this year's "IT" foodie which was FAB! im hoping this gets a spot in the Food Group Pyramid! #5 Fried Mozzarella my cheese obsession's Rock Bottom totally great beyond GOOD, #6 Fried Tamales, (Savory WINNER) For the Life of me and Robert, this was AMAZING!! #7 The Infamous Fried Butter SINFULLY GREAT!, #8 Fried Latte Different But but oh so Fab! #9 Fried Pinnapple Upside Down Cake and #10 Fried Pumpkin Pie (Sweet Winner) the pie was beyond!! !, dont let the size fool you, it was loaded! , HOLLY MOLLY sweet! As you can see from the list, my Best Friend and I clearly didnt get to 25, we were about to explode, but its was a Food Crawl to remember none the less, See everyone Next Year, maybe then we will hit 25! 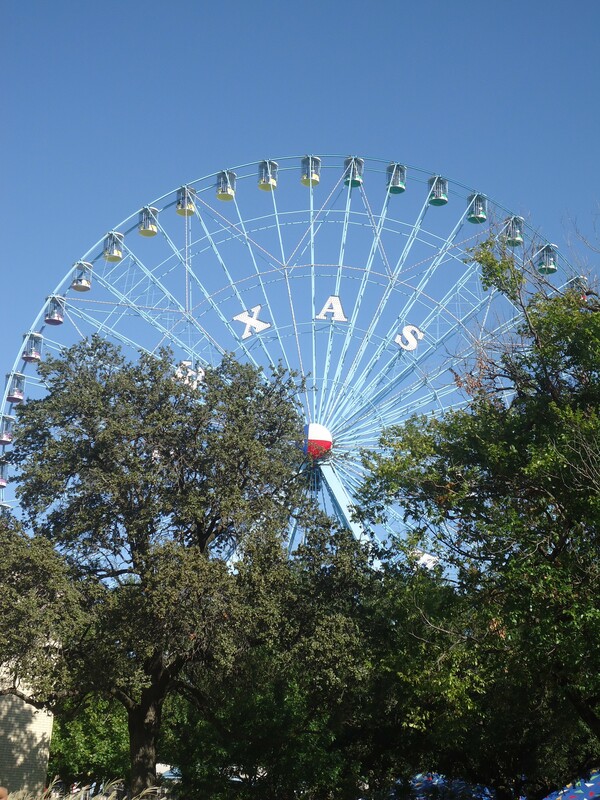 This entry was posted in | and tagged Bethenny Frankel, Big Tex, Corn Dogs, DALLAS, DFW, Fair, Food, Food Crawl, Fried, State Fair of Texas, TEXAS. Bookmark the permalink. I didn’t make it to the fair this year and I really wanted to. Some of the food looks great… some, well, I’m sure it tasted good. I want some fried pumpkin pie.